THE HESLOP HOUSE: WHAT IS THIS?!! So, I got up this morning and glided right into the usual routine, kids breakfast, school, gym, nap for baby and shower. I was skippping right through the whole get ready process and then as I proceeded to straighten my hair, something caught my eye. Yes ladies, the scene you are seeing right now is true, I have grey hair! I know this picture is horrible, thanks to my bathroom lights, but none the less they are there, and I can see them! I frantically pulled up my hair on the other side, and to my astonishment there were more, lots of them! So, i said to myself " I can handle this" I mean for crying out loud I 'm a hair stylist, but despite the fact that I can easily fix this problem, I thought more to myself, how did this become a problem? I mean, I know i'm close to thirty, but is that really when it happens thirty? How young! But then I thought to myself, do I WANT to fix this problem, is it really a problem? I always see those older ladies with pure grey hair, and it looks so pritty to me so natural, but I definatly think it would look more unnatural on me. And then I think, can I possibly be in the hair industry grey? And how fast does this advance? Maybe I just have stress spots, that would be nice, except for the fact that those spots probably just doubled when I noticed them. So really, I love hair no matter what color it is. And I think the face is what makes hair beautiful. everyone is so unique, and whether it's black, brown, blonde, red or yes even grey, I think we are beautiful. 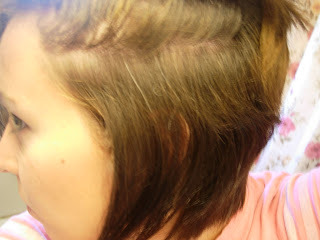 So for now, my grey hair is still there, for how long, I don't know. I am there with you. I discovered my grey hair at 24 and freaked. At first I would have my husband pull them all out with tweezers and then I started coloring my hair when it got too many to pull out and now I have just given up and letting nature take its course. Grey is beautiful! I LOVED this post! It makes me laugh, as I've found grays in my hair of late, but they're so light, that they almost look blonde. I can delude myself into thinking that's what they are....but I agree, gray is beautiful, and it's the woman that makes the beauty, not the hair! AAAAAAHHHHHHHHHHHH!! I am here for you whatever you decide to do! :) hehe. I don't notice my hair, let alone do it a whole often, so I'll bet I've got greys to, but I just haven't noticed them, point em out tp me if you see em okay? :) you are so great! OH you crack me up. Of course I can't see the grey from the pictures, but I will take your word. I can't say I've noticed any grey haris on myself, but that is probably because I can't say the last time I saw my natural hair. So let's just assume I have some too for your sake. Oh the joys of getting older! All the stress in life doesn't help as well :) Have a good day! Hi, thanks for the nice comment! It's good to see you're doing well! You have a cute family too. It's crazy how time flys, it doesn't seem that it's been that long, but it has.